�Koh Totang is an unspoiled, amazing island. What a chance to experiment such an amazing place, thanks to nomads land Cambodia for letting us get back to the roots in a beautiful and seriously astonishing surrounding, this island is special, snorkelling is colourful and with unexpected various marine life, thanks for the wonderful welcome and long life to the nomads." Koh Totang is a small island just next to Koh Sdach, home of Nomads Land beach bungalows. Without doubt offers some of the best snorkelling in the area, around its rocky coasts hold huge intact coral gardens. It has several beaches westerly and easterly facing. The Nomads Land serve organic meals, sunset cruises, and hammocks where you can enjoy the great view of the sea. 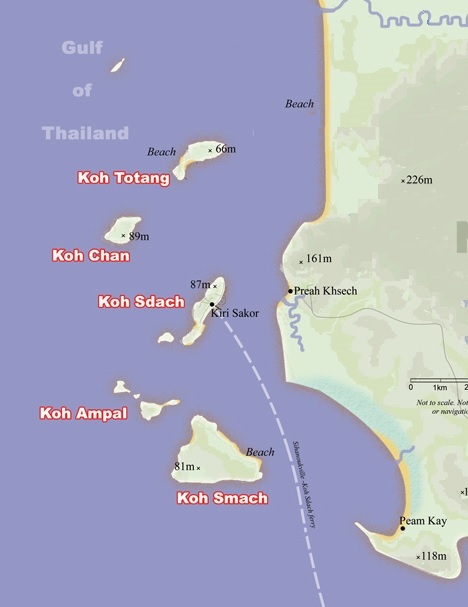 It's about 5km north of Koh Sdach. Koh Totang is a small, wild, naturally stunning, undiscovered and completely unbelievable island; serene and untouched. There are only nine other lovely neighbours living here, a few dogs, many secret beaches and plenty of space to call home. 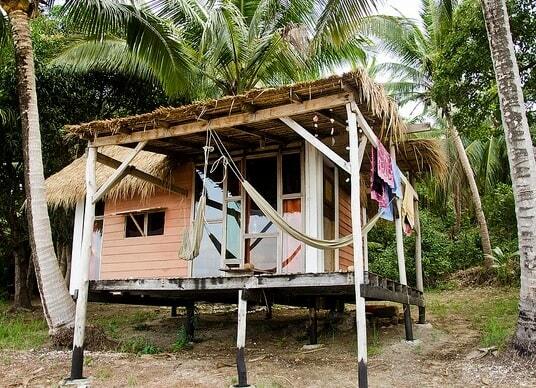 Nomads Land is the only guesthouse and restaurant on the island � it is completely undeveloped. Only 1.3 km by 500 meters in size, you can take an easy 20 minutes jungle hike to a private beach on the other side or go for a stroll around the island during low tide in about three hours. 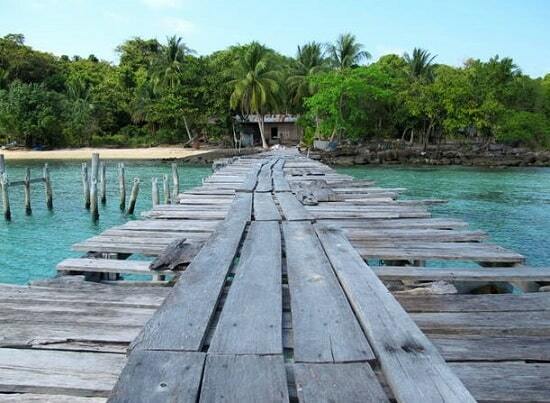 Koh Totang is in a beautiful and untouched 12 island archipelago in the Koh-Kong province. Located 60 kilometres from the Thai border and 60 kilometres from Sihanoukville, we are out of reach from your every day tourist, but easily accessible for those looking to get away. Just 5 km away, the closest and most popular island in the Archipelago is Koh Sdach � a small fishing village with a population of around 2000 families and two local guesthouses. The 11 other islands of this Archipelago, including ours, are almost completely deserted. Koh Totang is surrounded in all directions by a beautiful coral reef, it�s rocky coastline host colourful marine life, beautiful birds and hidden sandy beaches. Eagles and Falcons soar overhead through the jungle and toucans sing during breakfast in a nearby tree. Fireflies, phosphorescence and natural ocean luminescence leave the beach and sea glowing with neon light. You can take out one of the paddle boards of Nomads Land. Kayak around the beautiful island, take a walk to the sunset beach, read a book or simply take time out to relax on one of the comfy long chairs on the beach. Cruise for a whole day around the beautiful Archipelago of Koh Sdach. Enjoy the freedom of being at sea and check out some of the incredible nature that is found on the surrounding islands. Start the day off with snorkelling, sunbathing, swimming, fishing and canoeing from the boat. Stop on a beautiful stretch of beach for a delicious BBQ lunch. After indulging in the daily siesta, you can do a bit more snorkelling before heading home to your bungalow. The bungalows focus on simplicity and natural feng shui ensuring that each one has the perfectly placed hammock-terrace combination, an amazing view of the sea, and is perfect for a relaxing getaway. Each bungalow has its own individual character and design, all highlighting a different aspect of Koh Totang. All the bungalows have light in their rooms and patio. As this is an eco guesthouse, we work to preserve water as much as possible. With the use of common dry compost toilets and Khmer style shared showers, we are able to remain sustainable throughout the dry season. Only the Dive Inn & the Hop Bay Now Bungalows have their private bathroom. Take the first morning tourist bus heading to Koh Kong. Times vary but buses usually leave between 7am and 8am � check with your hotel/hostel. 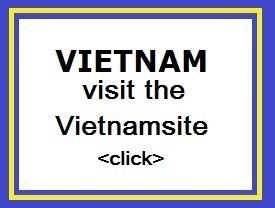 Ask the driver to drop you off at Caf� Sok Srei (around three hours from Phnom Penh), which is 6km after the town of Andoung Teuk. At Caf� Sok Srei they will be able to arrange a seat for you on one of the local minibuses ($7.5) going small island just next to Koh Sdach, home of Nomads Land beach bungalows. Without doubt offers some of the best snorkelling in the area, around its rocky coasts hold huge intact coral gardens. It has two beaches westerly and easterly facing. to Poi Yopon (around two hours). Poi Yopon is the local fishing village located in front of the Koh Sdach archipelago.